Campers arrive for check-in on Sunday the 14th between noon and 2 p.m. Campers may be picked up on Saturday the 2oth at 1:00 pm. The Camp has spaces for up to 60 participants, ages 11-17, rising 6th-12th grade, or equivalent. The majestic Belltower overlooks Clothier Hall, the Sproul Observatory, and Parrish Beach. 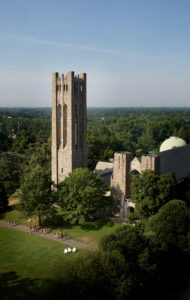 Magischola Prep Wizard School Summer Experience is held on the beautiful and private campus of Swarthmore College, near Philadelphia, PA. We will stay in a Swarthmore dormitory, use lounges as Court Common Rooms, and classrooms as, well, classrooms. We’ll also use outdoor spaces such as the woods and the Amphitheatre. All meals are in the Sharples Dining Hall. All campers sleep in standard twin dormitory beds, usually two students per room though there are some singles. Roommate requests will be honored as much as is practical; otherwise, students will be paired with another camper of similar age and the same gender. Counselors are interspersed among the campers in single rooms. Lights out for middle-schoolers at 10:30pm, high-schoolers at 11:00pm. Come to Sharples Dining Hall for delicious feasts and to swap stories from classes and adventures. You’ll have three meals a day from dinner on Sunday evening to breakfast on Saturday morning. Feel free to bring extra snacks for between meals, if you like. 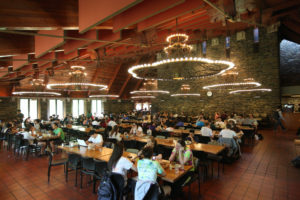 Sharples Dining Hall is buffet style, and you can choose from many options to eat, including burgers, pizza, pasta, sandwiches, soups, salads, cereals, daily hot entrées, and desserts. There is something for all dietary restrictions, including vegetarian, vegan, and gluten-free options. Foods have allergens labeled, and campers should read the ingredients before selecting a food item. If your camper has severe allergies or other dietary needs, you’ll get the chance to enter that on their medical form. The Northeast Regional Amtrak arrives hourly to Philadelphia, and there is a SEPTA train to the Swarthmore station. More information about public transportation options. Family discount: take $100 off of each camper’s price. Military discount: take $100 of the price. Full room and board from noon July 14, 2019 until 1:00 pm July 20, 2019 at Swarthmore College. This includes 6 nights, 6 breakfasts, 6 dinners and 5 lunches. Food is all-you-care-to-eat from the Swarthmore Dining Facilities. Certified counselors, faculty, and staff to guide and mentor campers 24/7. A school robe and tie to wear for the week; a wand to borrow if you don’t have one. A camp t-shirt to keep. Supplies, props, special effects, set design to transform Swarthmore into a Wizard School and create the Four Courts of the school. An acceptance letter mailed to your home address. A written character with a background from the magical world. Coaching and activities to develop improvisation, communication, acting, choreography. Bonfire, all materials for crafting and excursions. A Camp Dance with a DJ. A cast and crew to design, create, and act with you in this immersive theatre experience. The dream-come-true of going to Wizard School! 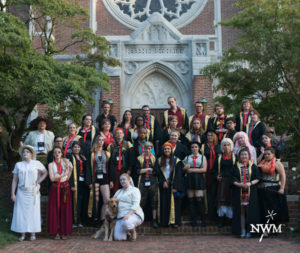 © 2016-2018 LearnLARP, LLC. All rights reserved.